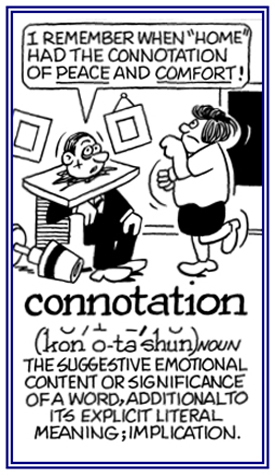 Although there are over 1,450 word entries ending with -ation or -ization listed in this unit, there are certainly many more which exist in the English language. At any rate, this unit provides a significant number of -ation and -ization examples for you to see. 1. Forms of verbs that express the categories of person, number, gender, tense, and mood. 2. In grammar, the process of systematically listing the inflected forms of a verb; that is, a form that is different from a basic form; for example, a plural form or tenses. 3. An exchange or transfer of genetic information between two individuals in certain types of unicellular organisms, including bacteria and some protozoa. 1. A supposed magic or supernatural occurrence achieved by pronouncing a spell or chanting. 2. A word or phrase that a magician says when casting a spell. 3. A summoning or invoking, usually of a supposed supernatural force, by pronouncing a sacred name. 4. 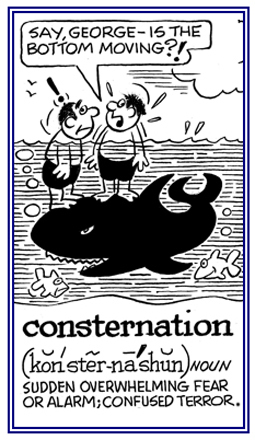 Etymologically, from Latin conjurationem; literally, "a swearing together, conspiracy". A commonly understood cultural or emotional association that some word or phrase carries: The term “home” has a connotation of family, comfort, warmth, security, and love; however, it also simply means a place where people live whether in harmony or not. © ALL rights are reserved. 1. A process, an act, or a ceremony that gives a religious endorsement of something or someone as being dedicated to religious purposes: The consecration of the residence for homeless people by the church was completed with the singing of hymns by all who attended. 2. A solemn commitment of one's life or time to some cherished purpose; such as, to a service or a goal in life: As a young man, Christopher vowed the consecration of his career to medicine in order to help others to live a better life. 1. Careful thought or deliberation: "Your proposal is currently under consideration." 2. Thoughtful concern for or sensitivity toward the feelings of others. 3. Something to be taken into account when weighing the pros and cons of a situation before making a decision. 4. Payment given in exchange for a service rendered; recompense, compensation: "She agreed to do the project for a small consideration." 1. A friendly association or alliance. 2. An ecological community that has one dominant species; such as, a forest consisting predominantly of beech trees. 3. A grouping of political parties or pressure groups within a region or country that work together to share power. 4. An association of churches or religious societies, especially Congregational churches in New England and Presbyterian churches. That which makes someone feel less disappointment or sadness: Jim's kind words and concern for his sister Sally at the hospital were a consolation for her. 1. A feeling of alarm, confusion, or dismay; often caused by something unexpected: Janet invited her ex-husband, Jack, over for dinner, which was met with much consternation by her new boyfriend, Ted, who was quite surprised about her friendliness with her former spouse. 2. A shocked or worried feeling, usually a result of something that happens unexpectedly: The serious illness of Tom's mother caused him much consternation, dread and anxiety; so, he went to be with her until she became well again. 3. Surprise and alarm, which results in panic, deep disappointment, or total confusion: There was general consternation when the terrifying news was published about the airport shootings. 4. 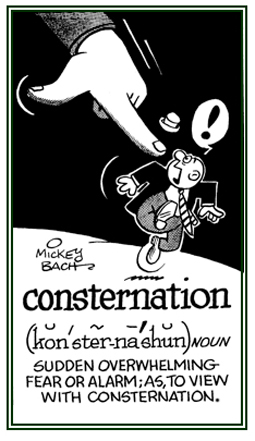 Etymology: from French consternation, "dismay, confusion"; from Latin consternationem, "confusion, dismay"; from consternat-, the past participle stem of consternare, "to overcome, to confuse, to dismay, to perplex"; related to consternere, "to throw down, to prostrate"; from com-, "with, together" + sternere, "to spread out". © ALL rights are reserved. 1. A condition in which a person or animal has difficulty in eliminating solid waste from the body and the feces are hard and dry. 2. An irregular and infrequent or difficult evacuation of dry hardened feces from the bowels which can be a symptom of intestinal obstruction or diverticulitis. 3. Etymology: from Late Latin constipationem, from Latin constipare, "to press" or "to crowd together"; from com-, "together" + stipare, "to cram, to pack". Treatment of constipation includes the consumption of plenty of fresh vegetable, fruits, milk, and an abundance of water is effective in treating constipation. A person should also try to establish regular bowel movements, proper eating, and exercise habits. Philadelphia, Pennsylvania; 1997; page 434. 1. A meeting in which someone discusses a problem or questions with a professional who is seeking advice: The business gave telephone consultations in addition to personally attending meetings with their clients. After consultations with the opposing politicians, an agreement was reached to go forward with the legislative proposal. 2. The process of seeking information from written sources to complete something: The teacher had her students use a variety of dictionaries for consultations of the words she had been listed for them to define. 1. An achievement or a fulfillment of an objective: At the consummation of the negotiations, the President signed the treaty. 2. Etymology: from Latin consummationem, which is from consummare, "to make up, to complete". Showing page 20 out of 96 pages of 1437 main-word entries or main-word-entry groups.